Before we get any further, a little explanation of SNI is due. SNI is an extension of the TLS standard, by which a client can pass a host name before the actual TLS handshake starts. The passed host name is then evaluated to select the correct service. Using this extension it is possible to serve multiple services with different domain names using a single IP address. It is the conceptual equivalent to HTTP name based virtual hosting. We removed all the unused frontend and backend parts of the configuration and adapted only the parts which are necessary for routing TCP/SNI traffic. This snippet is configuring the haproxy to listen on port 5050 using TLS (“ssl” in config) and a set of certificates. For each Openshift “route” contained in a representation of the routing “state” with TLS termination policy at the “edge” (that is at the HaProxy itself), a directive to route requests (use_backend) is created. The ssl_fc_sni expression extracts the SNI header from an incoming request, the header is then used for selecting the requested backend. As a next step it is required to generate the keys/certs for RabbitMQ instances or a wildcard certificate for the whole domain range which then can be used directly from the custom router itself. In our test environment we created our own certificate authority to sign the created wildcard certificate. To generate keys/certs we provide two scripts which first generate a certification authority (CA) and then a certificate. These scripts can be found in our repository. A wildcard cert is defined with a wildcard operator for the hostname in the domain name for example: *.testapp.apps.zhaw.ch. Once the wildcard key/certificate is created it needs to be passed to the custom router. The provision is made using a tls secret. This secret is then mounted as a volume to the router instance. The used scripts can also create regular key/certs per host. To do so, just replace the asterisk with the desired hostname. 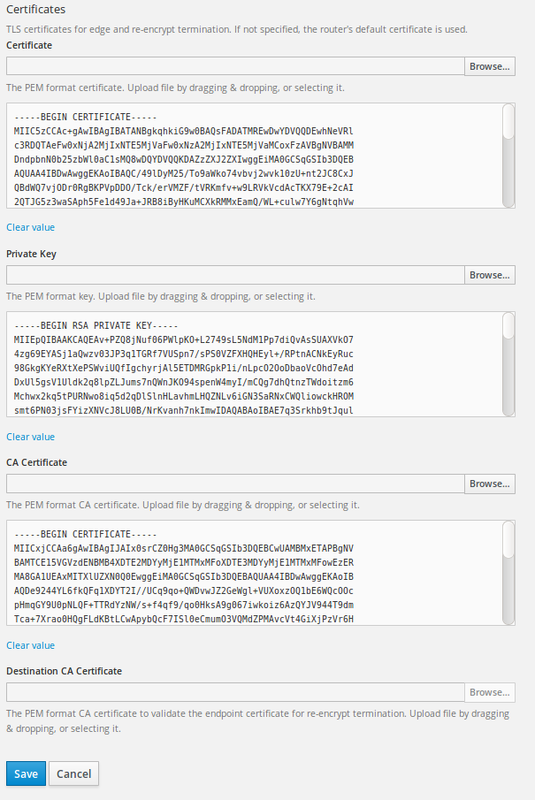 To use a key/cert per each host we have to add it when we are creating the route. A next step we can deploy our customized router instance. To do so, we provide yaml templates for the deployment configuration and also the service which is used to connect the router to the host network. This templates can be modified to fit the requirements of the cluster. Our customized router listens to traffic on port 5050, this can be changed in the yaml template and in the configuration template. To let in traffic on port 5050 we need to open this port on infrastructure level and also inside the vm itself. In our case we had to edit the AWS security group and add a iptables rule to the vm. 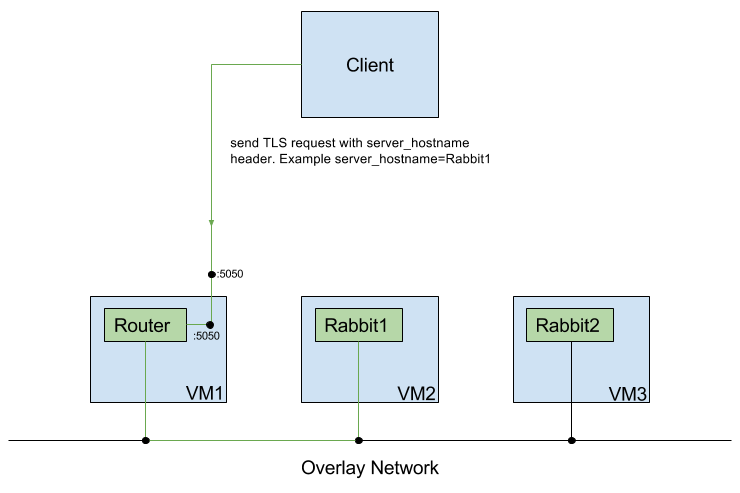 If not already there the RabbitMQ instances should now be created. The templates are also provided in our repository. Don’t forget to add the routes to this RabbitMQ instances. This needs also to be done when a wildcard certificate is used, to have an endpoint with TLS termination at the edge. There are a few things we can check to see if everything is working as expected. if the router instances are running, exec into it and look at the generated configuration. oc exec -it POD_Name bash, then cat the haproxy.conf to see the generated configuration. This entry was posted in *. * and tagged cloud, openshift, paas, robotics, sni, tcp by loeh. Bookmark the permalink. Where can I find the router_dc.yml & router_dc_svc.yml files ? I can’t find them on the github repo. You can find them on the bitbucket repository also linked in the text. It looks effectively interesting. Thanks! – Add the config for port 5050 in the template of the existing router? – Add a second router with additional floating IP?